Although winter has been calm so far, we’ve only made it to the middle. Six more weeks until the drab camouflaged colors of winter turn to green and spring once again fills us with new life. Until then, you can accelerate the warm temperatures and fresh colors with plants inside. Terrariums are making a comeback. Don’t think of old pickle jars and moldy plastic plants of the 60s and 70s. Terrariums have been updated to blend in to a contemporary lifestyle or even one that makes old things new again. Take a trip to a thrift store or estate sale (or even your attic) to find an old clear glass coffee pot. Perhaps you can find an old French press or percolator. Buy some air plants. Place white sand and rocks in the bottom and add the plants and other decorative items like driftwood. 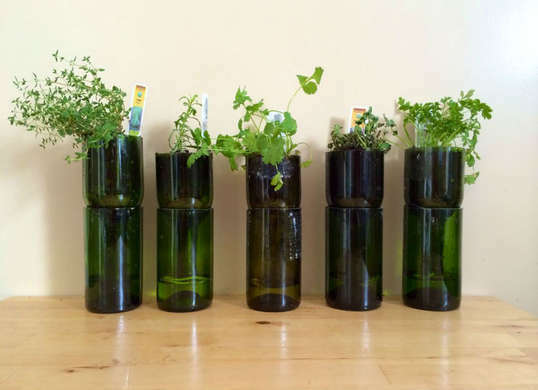 Turn empty wine bottles into small indoor planters. You can either have the bottles cut into two sections—or try your hand at cutting them yourself. Invert the neck into the bottle’s base, which will hold the water. Buff out sharp edges with sandpaper before layering the planter with rocks and potting soil. Use herbs or other plants to brighten up a small spot in your kitchen. If you don’t want to go to the trouble of cutting bottles, find clear bottles of several sizes for your terrariums. Use cactus soil and succulent plants. Succulents will thrive in a terrarium environment. They won’t need direct sunlight either, which will help on overcast days. Use an inch of cactus soil, divide succulents into single-stem plantlets, each with roots and place in clean bottles. These desert plants require only a drop of water every two weeks or so.